Looking for recent reviews of the FMB software. I can only find ones that are about a year old.Can you comment on actual software usability / quirks? Are experiencing (even remotely) some of the same symptoms as those that have commented elsewhere? So far I have found the app to be very useable. I know some people have reported that changing the size of the text when deleting deletes the card, random crashes etc and I have to say that I have experienced none of this. The update in late August enabled much better syncing between the desktop and iPhone apps, enabling a much needed feature for me which was the ability to play audio created on the desktop app through the iPhone and vice versa. I have some very large cardsets (into the hundreds) with audio included on every one of the cards and they can take a while to load when loading from fresh but that’s to be expected. I haven’t had need to make extensive use of their support, but I have emailed once or twice and received a prompt and helpful reply. Hope this helps – are you thinking of buying? Thanks for this – another excellent resource worth knowing about. Just wondering – where did you get the audio files for the Duff vocab.? Also, if anyone knows the rationale of Duff’s choice of those 600 words I’d love to know. I think it’s a great place to start but have often wondered how the list was compiled. I got the audio clips by playing around with the audio cd that came with the book when I bought it. As this was something I had paid for and it’s for my own personal use I guess that’s ok in terms of copyright. The audio CD contains all the vocabulary on the first CD, with the second CD containing read portions of the NT. If anyone’s reading this and is using Duff’s ‘Elements of NT Greek’ I highly recommend also getting hold of the CD. I’m about to embark on the journey through Duff’s Elements and have been searching for some kind of iPhone app that would help with vocab, so thanks for the tip-off. 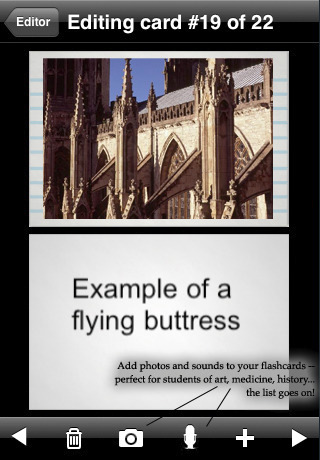 Just out of interest, have you made your cardset available on the FMB website, or do you know of others who have uploaded Duff’s vocab? Am reluctant to buy unless I know I’m going to get what I need! hello and thank you for this great review. I just want to know how does the leinter system work? I know the system and I’ve been using it for more than a year withe traditional paper flash cards but I’d like to know how does it work on flash my brain. How many repetition there are and how much delay there is between each repetition.Thanks a lot. The Leitner system works by having 6 ‘boxes’ (displayed in landscape view at the bottom of the screen) ranging from ‘New’ to ‘Mastered’. You can see this on some of the screenshots above. Every card starts in ‘New’ and whenever you get the card right (by choosing not to ‘review’ the card you are assumed to have got the card right) it moves forward a box. Getting a card wrong moves it back a box. Thank you very much . I’m so happy with you response. I have another question about the desktop app if you don’t mind. 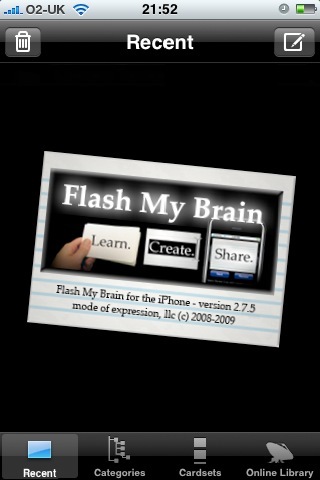 I want to know that “Flash my Brain” is a web based app (I mean we have to open it in a web browser ) or it’s a desktop app. Does it work on Mac? Does our progress in the leinter system synced with the iPhone and the offline version?I live in Bahrain and unfortunately it’s not possible for me to buy the iPhone app. is there another way to buy the iPhone version? Thank you very much and I’ll appreciate your help. Sam I find your feedback on the FMB software very helpful. Have you ever printed out any of your cards, and if so how did that turn out? Sayed Ali – You can access the desktop version through your web browser (I access it through Safari for the Mac quite happily) and you can download the software as an application up to 3 times… I don’t know about the Leitner syncing as I tend to stick to using my iPhone for memorisation and only really use the desktop app for creating new cards. Nate – I haven’t made any extensive use of the facility to print out my cards as I tend to use my iPhone. I had a go when I first bought the software and did so without any troubles – although I gather from other forums that users have had difficulties with it. That is great! thank you. I am also using Duff’s book. is there a way to get those words? Hi Joel, as I said to Richard above, the non-audio version is available via the online downloads section of the flash my brain software under ‘Greek’. Send me a message via the contact section if you have problems. I have the audio cd. but how do you get the clips on the cards? I am looking at Flashcard systems to learn Chinese. I want to concentrate more on Pinyin and pronunciation rather than the chinese characters, but characters will still be useful. Has anyone had any experience with Chinese on Flash My Brain. What are the existing databases/lists of words like?Also, the website says Flash My Brain can be used on PDAs. I have a Compaq Pocket PC – (1996-2001 )Version 3.0.11171. Can I use it on this or is my PDA a little too old. I have had some trouble with other PDA flash card software, probably because my PDA is a bit old. Does this app include an option to take a card out of rotation? I am wanting an app that will remove mastered cards, but I don’t see anywhere whether Flash My Brain will do this. Yep, if you look at this screenshot – http://twitpic.com/cz7ze – you’ll see that you can tick card to either appear or not appear in your rotation. The leitner system will also show mastered cards a lot less frequently if you want them to appea, but only rarely. You have a very helpful review, and I nearly bought the iPhone and the desktop-app, but then realized: Is it true, that FMB cant make a “viewer” or similary way to share my flashcards with my students? I am in the situation as a teacher, that I have to be able to give my students (both mac’s and pc’s) these flashcard-decks for viewing. Can FMB do that and in what way? As a quicktimemovie of “paused dias'”? Their own site does not mention… I almost get the feeling that one has to own another license just for accessing and viewing a shared deck? Hi Poul, I’m not aware that it can (although you can print the cards). I think your students would have to own a copy of the software to view cards you had created. hey, I want to make the rest of the cards for the following chapters. Do you have a quicker way than Gband to split the files? Be VERY careful BEFORE you purchase this. We were trying the Windows version, and felt safe with a 30 day refund through Paypal. We found that it didn’t meet our needs within 3 days, and they have NOT returned our money – with three months of trying. My kids are taking Latin – and that was our reason. It takes far too long to create cards online for us to use them, and font selection didn’t work well. The 30 day trial seems to be a way to keep your money. They have promised to return the money twice in the last three months. Forums have plenty of people lacking support – and many more waiting for refunds that never came. Horrid customer service. They stole our money. I’m sure this is the first bad review of a purchase that I have ever made on the internet. I think 3 months of patience is enough. Buyer Beware! I use Audacity although I guess Garageband does the job just as well. The only thing I suggest to make it quicker is to select the relevant bit of audio and ‘convert selection to mp3’ (or something like that) for each word in the chapter which does make it a bit quicker. Hope that makes sense – I don’t use Gband but am assuming there’s the option within it to do much the same. Let me know when you’ve created new ones as I wouldn’t mind having them myself. Good luck! P.S. I’ve uploaded the audio for up to ch 11 so far. thank you so much! my class is using this book. we have to go to chapter 12 this semester. we have to do the rest in spring. 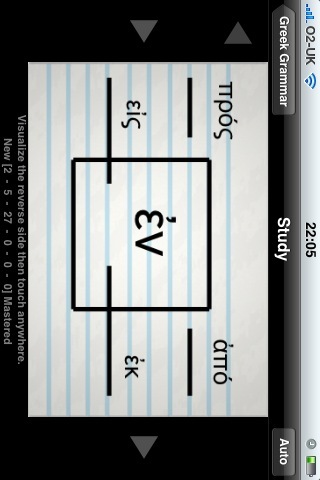 I recently uploaded the remaining cards for Duff’s Elements of NT Greek. All 600 words are now on there… Takes a while to download but if you create your own set from this it’ll store the files locally. these guys are useless no customer service their iphone app is crashing but help, i want to download the software again they asked me to contact them I did several times no reply. absolutely no interest in doing bussiness save your money and run. Hi Sam,Thanks for the review. 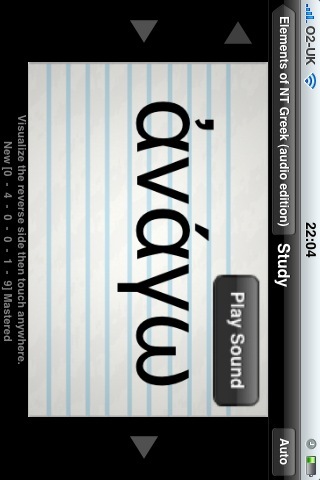 I have the ipod version and was wondering whether it’s possible to enter Greek fonts from the ipod/iphone? I haven’t found a way to do this yet and am guessing I may have to shell out for the desktop version at some point! I just had a thought – if you have a Mac, you could install ‘pastebot’ (from app store) and then any text you copy (eg Greek) will get added to your Touch clipboard automatically enabling you to paste into Flash My Brain. Just a thought. Will only work if you have a Mac though. Do these flashcards allow you to start/stop audio files on the cards? I am trying to learn bird calls, and have recordings which are several minutes long and I am trying to find a flashcard program which allows me to control when to stop and start the audio. Thanks! Not ‘mid audio’ as far as I am aware. You can choose for the audio not to play, but not ‘pause’. Does it at least stop playing the audio file when you move on to a new card? The flashcard software I currently use keeps on playing the audio file even after I move on to the next card if there is no new audio file to begin playing on the next card, and it is very annoying. Thanks! This ap has the potential to be the standard bearer for flash card aps, however the complete lack of customer service from the company keeps this ap stuck on the floor. The ap is minimally functional with the new IOS update, (on iPad, iPhone) which is why I purchased the ap, the portability. But with that feature gone it doesnt make sense to use it. All emails I have found and tried in contacting the company dont work, so if you believe that you may need help at some time, this is not the ap.